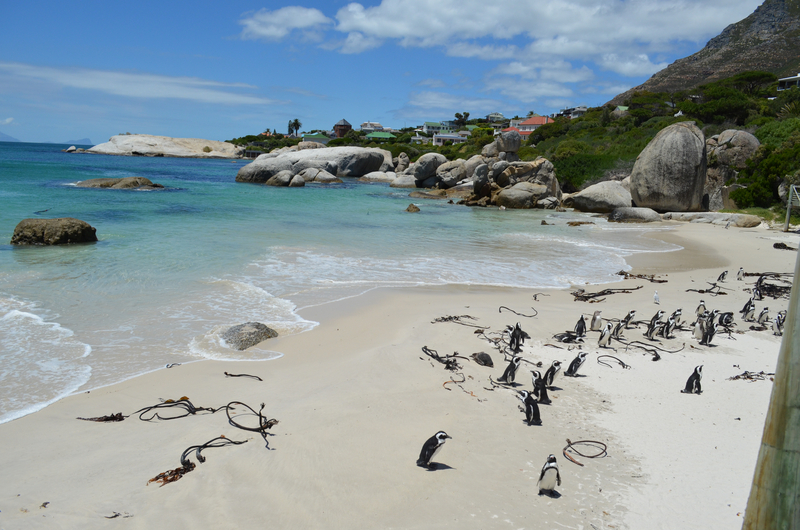 Day 13- This morning we arrived at Cape Town and transferred to the Beautiful Cape Grace Hotel. One of our amenities there was to be a room upgrade subject to availability. Due to the Holidays the hotel was full but when we got to our room it was so lovely that we could not imagine how much nicer the upgrade would have been. We also had free access to the Mini bar plus a free bottle of wine. 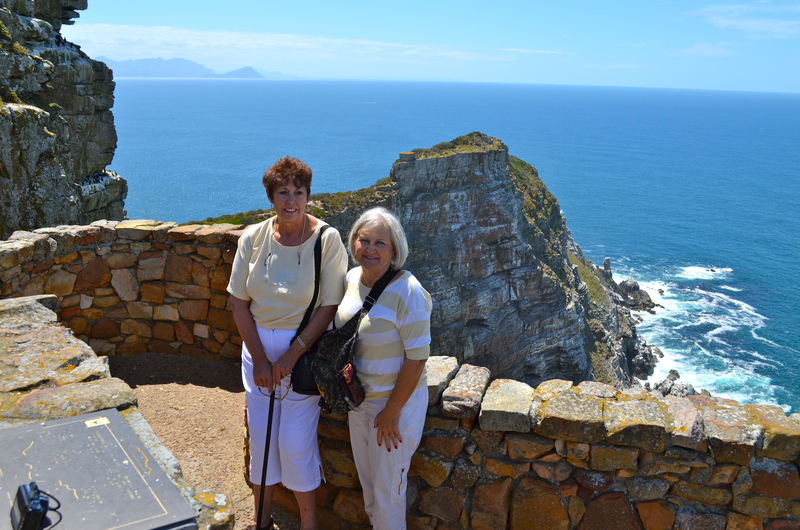 Before going to the hotel our Guide suggested that since the weather was so good that we should visit Table Mountain. If one has a fear of heights and cable cars, it is defiantly not the ride for you. 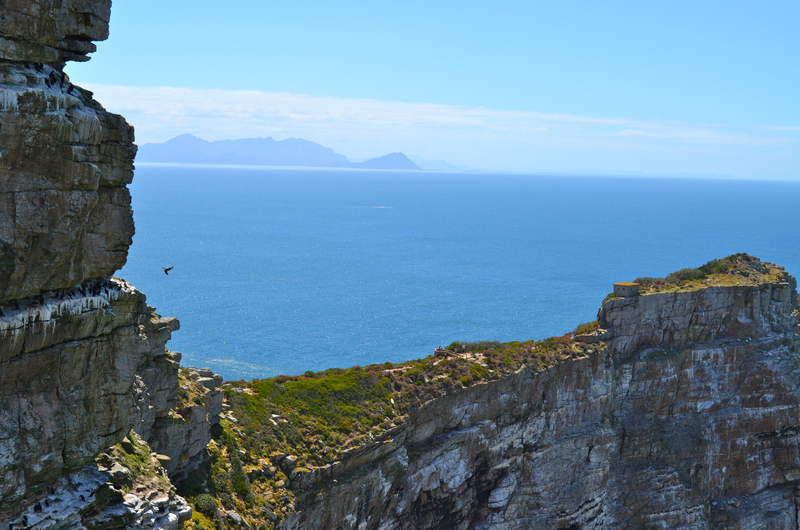 Table Mountain is the backdrop for the city of Cape Town and it is flat like the top of a table. When the clouds cover the table it is said that the tablecloth is on. Looking at Cape Town from the waterfront one sees a lovely city with the mountain behind. 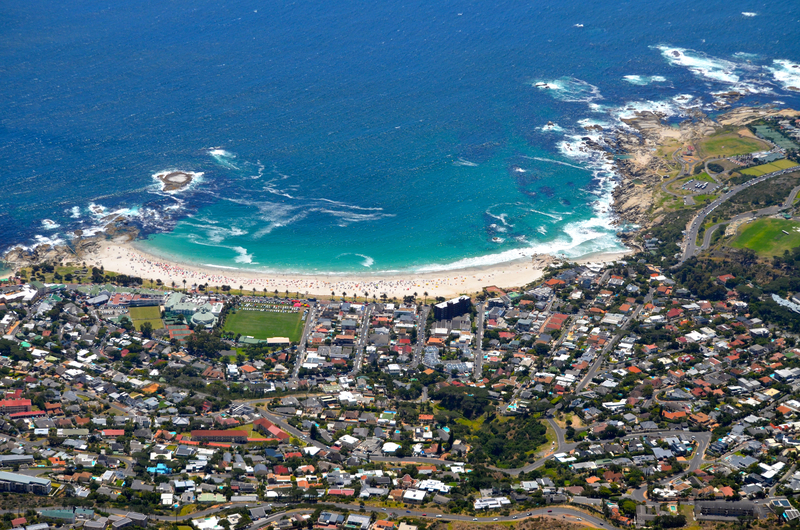 In all of the places that I have visited I think that Cape Town ranks among the top beautiful cities from the water. The others being Sydney, Santorini, Greece; San Francisco, and Auckland, NZ. After settling in we went to the waterfront for dinner at Seruva, recommended by the hotel. We had a good dinner of salmon in puff pastry then set off to explore the shops. We were in search oh the Red Shed which houses artisans. Our friend has a friend who exhibits there. We found his shop but he was not working that day. We saw some of his wood turnings which were really beautiful. He seems to be a master wood turner. Cecilia visited the Apple Store for some advice and equipment. I guess Apple is like McDonalds and Starbucks. They are everywhere! 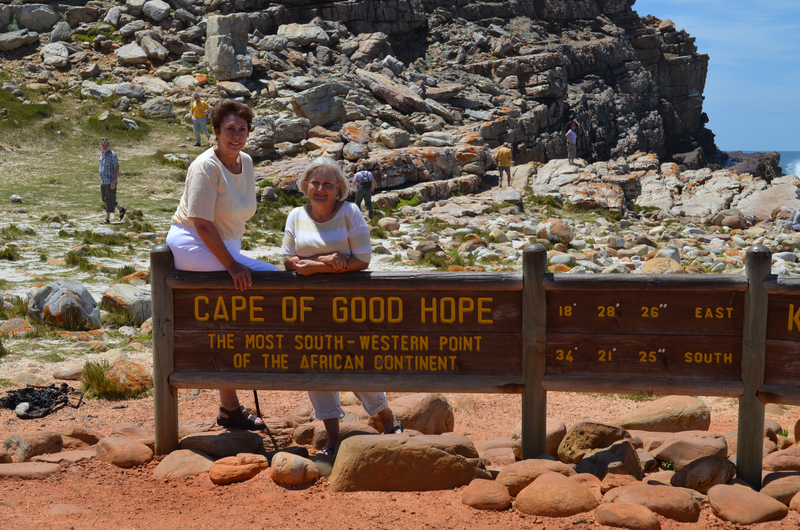 Day 14- Jack, Our guide, picked us up and we headed toward Cape Point and Cape Good Hope where the Indian and Atlantic oceans meet. 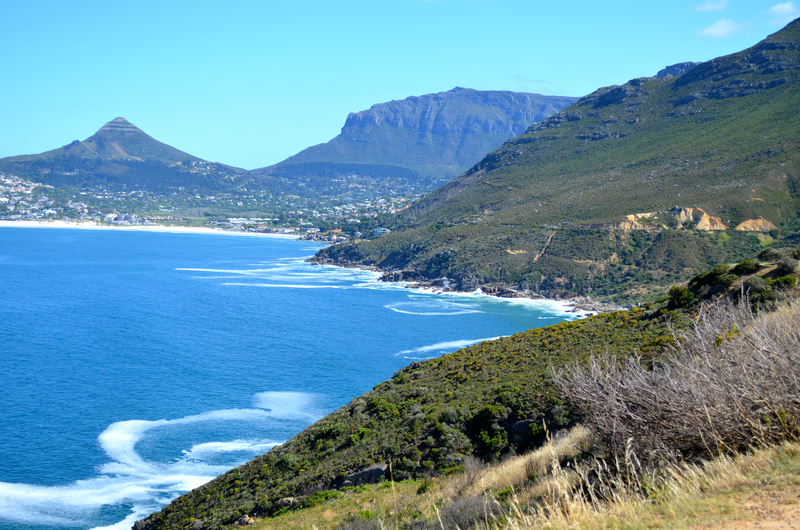 The drive to the Cape is stunning with fabulous views of cliffs, blue, blue water, sandy beaches and houses perched precariously up and down mountains. 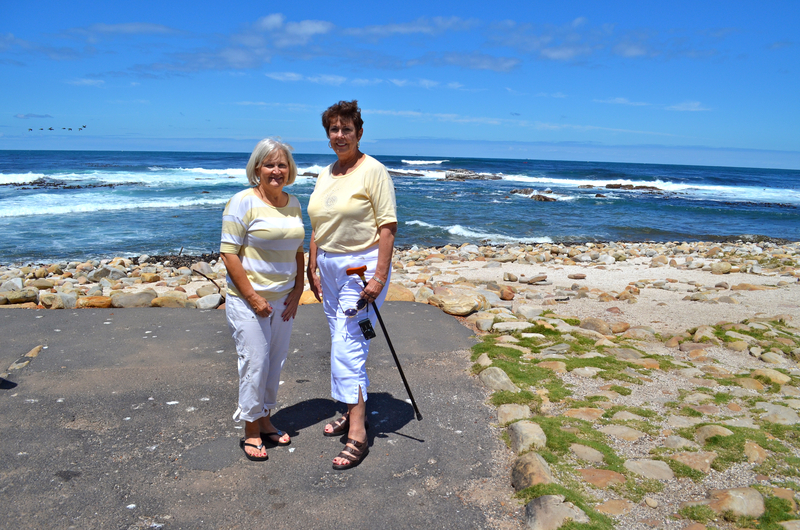 We did a circle around the southern part of SA and stopped for lunch in Haut Bay at the Harbour House Restaurant. We had a private dining alcove on the deck and enjoyed quite a show put on by the seals. After that we stopped to see the penguins. 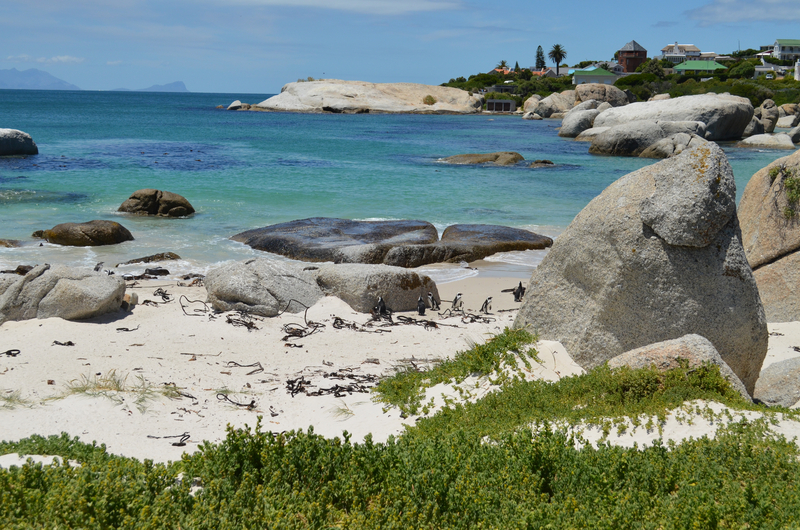 The SA penguin is not very large but it is great fun to watch them march around in their "tuxedos". Our next stop was the lovely Kristenbosch Gardens (I think I have misspelled this). We had a guided tour on a cart so we were able to cover almost all of the gardens. The gardens are really beautiful with not only the native plants but many varieties from around the world. The gardens were first established by one of the diamond pioneers, Cecil Rhodes and later given to the city. It had been a long day so we had dinner at the beautiful Cape Grace overlooking the marina. Day 15- Up to now I have not confessed that I had an accident the second day on Safari. It had rained very hard during the night and the next morning as I was going down the steps from the room I slipped and hurt my knee. Those of you who know me well are saying, "there she goes again, falling around". I promise you that I was aware of the wet steps, had on my tennis shoes and was holding the railing which was too fat to really hold but my feet slipped out from under me. I am now beginning to think it is my lot in life to fall around the world. I hobbled through all the safari as there are only witch doctors in the jungle. Fortunately I had brought a cane to make steps easier. Without it I don't think I could have managed. The injury slowed me down but I still ( and I will confess with a lot of pain) managed to keep going. I finally got to a hospital here in Cape Town yesterday, had X-rays and found out that I have a ligament problem. I now have an impressive knee brace and have learned my limitations and they are that I can do but not to overdue. I was actually afraid that I had an even worse injury so I was relieved with the news. The MediClinic that I went to is a private one and it was a great facility, new, sparkling clean and similar to ours except for the prices. In order to get an X-ray I had to go through the emergency room and see a doctor there. He was a very nice young Indian and insisted that I be rolled on the bed to x-ray. He read the X-ray and asked what I planned to do about the Knee problems I had before this injury. I have been told before that I need a knee replacement. I told him when it was absolutely necessary I would have one but not before!!!!!! I got to the hospital around 9:00 and had seen the doctor, had an exray, got fitted by a orthopedic fitter (whatever they are called) and was finished by 12:00. That would not have happened in Naples. The emergency room doctor charged $40, no charge for the emergency room, the X-ray was $60. The brace was the most expensive thing, around $100. Our guide said that there is government medical care and private. Those who can afford it pay for private as the government care is not very good. After the dentist and the hospital I guess I am qualified to talk about medical care in SA. I was pleased with the whole process. We boarded the Nautica in the afternoon and were so happy to unpack and put things where we hope we can find them. The worse thing about traveling from place to place is never knowing where anything is. As we were checking in I looked at the lady in front of me and said, "Hello, Paulette. " She had been on the last cruise I was on. We met Trudy and Dennis, friends from Bonita Springs for dinner. I have seen several of the wait staff from the last cruise. They always recognize past guests and give a very warm welcome. One of my special cocktail waiters, Christopher from India has been promoted to Jr. Head waiter. I have seen Bernardo, another favorite and hear that I will be seeing more as the time goes on. Jerry Blaine is back playing piano. I told him I had to find a great music trivia team.. He remembered that I was on the team that had 3 perfect scores.